An IFF system – Identification of Friend or Foe – are used by military aircraft in battle situations to determine if another aircraft is being piloted by a fellow aviator or an enemy. For the boots on the ground, friendly fire is generally regarded as a very bad thing, so a few students in [Bruce Land]’s ECE 4760 class at Cornell decided to make a wearable version of an IFF for their final project. 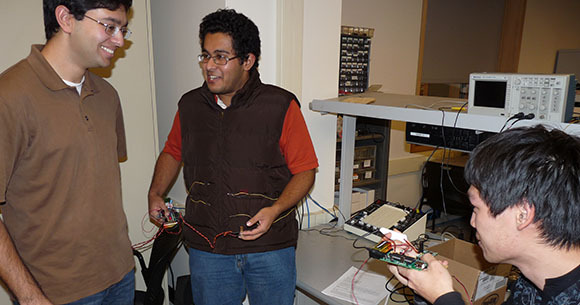 [Wen Hao Lui] and [Aadeetya Shreedhar] broke their project down into two parts: an initiator unit and a receiver unit. The initiator unit sends an encryption key to the receiver unit which, in turn, replies back to say, ‘don’t shoot.’ [Wen] and [Aadeetya] needed to choose between using RF or laser-based communications for the initiator, but the difficulty in acquiring or building a radio antenna with the requisite directionality made a laser the obvious choice. The receiver unit has eight phototransistors attached to a vest and will reply to the initiator unit via a Wi.232 radio module when the laser illuminates the phototransistors. In the event of an enemy acquiring one of these vests, the project includes a pulse detection circuit that will erase the encryption keys when the wearer’s pulse drops to zero. A bit morbid, but the video after the break sure makes it look cool. Please read the article first, it says that it sends an encrypted key so it won’t respond to just any message, and its directional so responds won’t be recieved by the others. The laser beam may be directional, but the RF response isn’t. As Chris implies, if the system is triggered by a “friendly” laser signal, the response can (and probably will) be monitored by anyone else in the neighborhood with the right equipment. Aircraft IFF systems do have a light that indicates an interrogation. No reason you couldn’t have a similar functionality here. In aircraft yes this is good as it is not likely that an enemy will have captured your aircraft or a functional transponder. However with foot soldiers this just opens the door to combatants capturing a soldier and using his transponder to fool others into not shooting. Don’t see this as remotely feasible unless biometrics are tied to the transponder an each soldiers ID is unique based on DNA. From there it would further require a time based parameter by where an ID would need to be checked against a database to determine last known active status. This way it could be determined that if an ID had not been seen in at least 8-12 hours it can be presumed compromised and flagged as “Unsure” and would have to be re confirmed before gaining Friendly status. Yeah, I’ve often thought about a system similar to this. Weapons systems too. The problem is always “what if it falls into enemy hands”. You don’t want the enemy using your own weapons against you, nor do you want them putting one of these on and walking up to you while your unit says “hey, that’s a friend, don’t worry about it”. The pulse idea is good thinking, but suppose the guy isn’t dead? Just incapacitated? Then they have a good, working unit. I think, they could probably get by with some sort of “rolling code”, that changes every so often. and unless they’re among the friendlies, they don’t get a working code. So if I bad guy picks one up, pretty soon it says he’s a bad guy. But then you have the problem of isolated soldiers. Great ideas, but very hard to implement. So, every time they take off the vest, they’ll have to get it reprogrammed? That seems like a drawback. or put in code to unlock it. I would even worry about bio-metrics in a military situation. Taking a soldier’s thumb when you take his vest wouldn’t be out of the question. This device would also have to be tamper-protected to make it harder to rip the key from the device’s RAM while still attached to an injured or captured soldier. With an entire army sharing the same secret key, there would be a big incentive to hack this thing and make an IFF spoofer. Did anyone notice it’s a student project? It’s an educational task with a weak but still somewhat plausible brief. Seems like they met their targets and fulfilled the requirements, and probably learnt something along the way. No-ones being asked to trust their life to the thing, you’re a tough crowd! Why build a IFF system that you wouldn’t trust your life to? Wouldn’t this be similar to painting a target on your face? Say I’m fighting the Hmong in a land war in Asia….they don’t have this system….so they figure anyone that has any response, encrypted or not, correct key or not, is shot dead. Am I missing something? This device ONLY replies if the correct key is sent AFAIK, so it would not reply to the wrong key. While the designed unit would not be practical in actual combat situations,it could be used be used in laser tag games where hacking the signal could be deemed illegal and the team of anyone doing so would be disqualified. pair it with the M.I.L.E’s gear i used when in the National Guard . (laser tag for training ). and you can have it “see” your enemy and your side , mount it to your weapons so as not to kill your buddy .